Whimsical in design, these earrings are the perfect way to celebrate the beauty of the pregnant body and the imminent arrival of your little one. The tiny bead in the spiral tummy symbolises the new spark of life and comes in the birthstone colour of your baby's due date. A perfect gift for yourself, the new mama-to-be, your midwife, OB or doula. 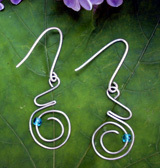 Designed by Twinkle Little Star and fashioned from hand crafted sterling silver ear hooks, sterling silver wire and glass beads. Pregnant motif is approximately 1" high. 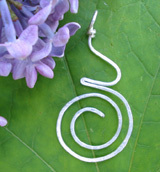 The same whimsical design as our earrings but this time fashioned into a 2" pendant and strung on a satin cord. Our unique pregnant sillhouette design is now fashioned fromsterling silver and then hammered to add texture and strength to the design. 2" pendant and strung on a satin cord. Click to view larger image in a new window. Every element of this bracelet has been chosen for its symbolic power. 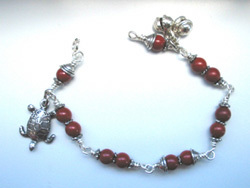 Red Jasper beads are believed to be a talisman for courage and to bring relief from pain. They have been sacred as an aid to women in childbirth, to increase the milk supply while nursing and to stop heavy menstrual flow and bleeding during birth. They are thought to be a firm protection against the evil eye and negative influences and are revered for their protective qualities for a pregnant woman and her unborn child to keep them free from disease, injury, and deformity for the entire course of pregnancy. The pewter turtle charm has long been a symbol of the primal mother and Mother Earth. She will care for us, protect us, lend us her strength, and nurture us, but for that to happen we must slow down and heighten our sensibilities. A potent reminder during labour that we are connected to the earth and if we trust in the primal mother that is in every woman, we will make our way through. The silver bells are a long standing symbol of purity of thought. Their sound is believed to clear the mind and allow it to focus. It has been said that the sound of bells is so pure that it will ward away any negative influences. Bells are also a symbol of divine female energy and wisdom. A reminder that you do know what to do, to clear your mind and focus. Trust in yourself. Also a beautiful way to focus during labour to the delicate jingle of the bells. The beads are capped with lead- free pewter bead caps and strung on hand-linked sterling silver wire. The bracelet is completed with a lead-free pewter turtle charm, silver plated bells from India, and a sterling silver clasp. The perfect piece to throw into your suitcase or labour bag to help see you through. A solid red jasper nugget, believed to be a talisman for courage and to bring relief from pain dangles from a handmade hammered and stamped sterling ring. Red jasper has been sacred as an aid to women in childbirth, to increase the milk supply while nursing and to stop heavy menstrual flow and bleeding during birth. It is thought to be a firm protection against the evil eye and negative influences and is revered for its protective qualities for a pregnant woman and her unborn child to keep them free from disease, injury, and deformity for the entire course of pregnancy. The sterling silver bell (handmade by the Hill tribe) is a long standing symbol of purity of thought. It's sound is believed to clear the mind and allow it to focus. It has been said that the sound of bells is so pure that it will ward away any negative influences. Bells are also a symbol of divine female energy and wisdom. A reminder that you do know what to do, to clear your mind and focus. Trust in yourself. Also a beautiful way to focus during labour to the delicate jingle of the bell. A Moonstone leaf completes this amulet. Moonstone aids receptivity, and will help to prepare the mother-to-be to welcome a new life into her body, and the new phase of life that comes with pregnancy and the arrival of a new baby. Some people say that moonstone will help to call your intended baby's spirit to you. It is an overall promoter of female reproductive health. Comes strung on an adjustable leather thong necklace. Celebrate and support your pregnancy and birth with our sterling silver and gemstone bracelet, created with carefully selected symbols and gems to nuture and protect both mother and child. Aquamarine: a highly protective stone during pregnancy, it helps to guard the mother and baby from harm, and is said to discourage miscarriage. White agate: the ultimate pregnancy stone, it helps to protect mother and baby from harm, eases morning sickness, soothes labour pains, and ensures a healthy flow of milk for the baby! Moonstones: aids receptivity, and will help to prepare the mother-to-be to welcome a new life into her body, and the new phase of life that comes with pregnancy and the arrival of a new baby. Some people say that moonstone will help to call your intended baby's spirit to you. It is an overall promoter of female reproductive health. This bracelet is finished with our exclusive signature pregnancy spiral charm in hammered sterling. A swarovski crystal birthstone bead dangle may be selected in the colour of the due date month. Malachite is an important gemstone to be used during labour and delivery. It helps to stimulate contractions, ease labour pains, and protect both mother and child throughout the birth. Due to it's vibrations that are said to start contractions, we do not reccomend that it is worn on your bracelet until your due date has arrived. This charm comes on a spring clasp to easily add to your bracelet.